Bhopal, 26 Jun 2018 [Fik/News Sources]: The judicial probe into the encounter of eight SIMI activists in Bhopal has given a clean chit Madhya Pradesh police saying “death of escaped persons was inevitable and reasonable in prevailing circumstances”. 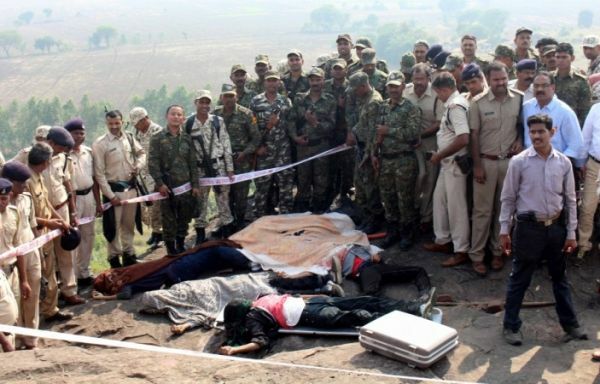 Eight SIMI members, who had escaped from Bhopal Central Jail in the intervening night between October 30 and October 31, 2016, were shot dead by the police on a hillock near Bhopal. “The deceased persons were asked to surrender but instead of complying, they started firing at the police and public. So, it became necessary for the police to open fire on persons who had escaped from lawful custody. Even after the police opened fire they showed no intention to surrender and as a result, sustained injuries and died on the spot,’’ the judge said quoting depositions on the affidavit. Minister of General Administration Department Lal Singh Arya had tabled the report on the inaugural day of MP Assembly’s monsoon session on Monday. The report recommended establishment of a committee to examine loopholes in jail security and backed formation of a training institute within Jail Department on the lines of the state of Punjab. Underlining the need for fresh recruitment, the commission headed by justice (retd) SK Pandey has recommended merger of Jail Department into Ministry of Home. The departmental enquiry ordered against the jail staff should ascertain the responsibility of negligence in jail security. Kin of the dead SIMI activists and several other organisations had termed the encounter fake.